2018. Women, Activism and Apartheid South Africa: Using Play Texts to Document the Herstory of South Africa. p. 181. Michael Silvers Ryan Koons Kathleen Wiens and Alisha Lola Jones 2013. Yearbook for Traditional Music, Vol. 45, Issue. , p. W-1. James, Deborah 1997. ‘Music of origin’: class, social category and the performers and audience of kiba, a South African migrant genre. Africa, Vol. 67, Issue. 03, p. 454. 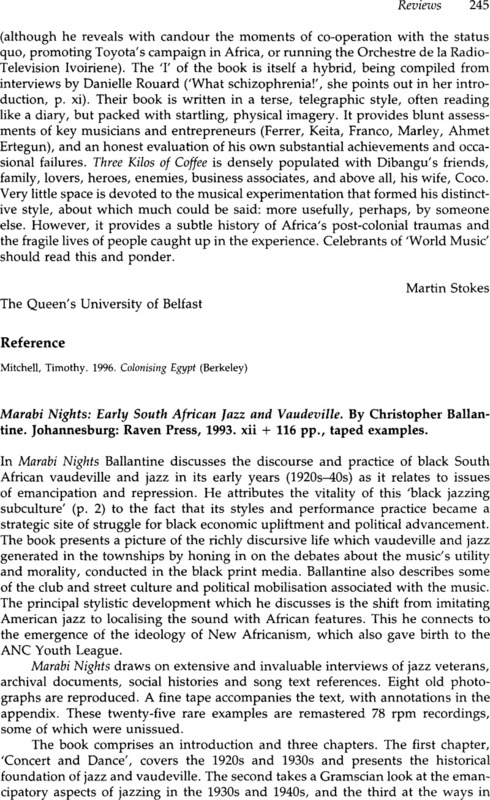 Marabi Nights: Early South African Jazz and Vaudeville. By Christopher Ballantine. Johannesburg: Raven Press, 1993. xii + 116 pp., taped examples.